I don’t want to inject myself into today’s events, but I can’t ignore them either. 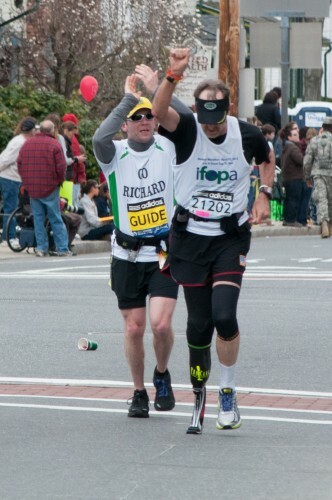 Like every year, I had been looking forward to the Boston Marathon for quite a while. Patriots Day (a.k.a., Marathon Monday) is my favorite day of the year, and for good reason. It’s the day that I go to work and am largely allowed to shirk a good deal of it. Walking from my office to the center of town through idyllic suburban neighborhoods is refreshing and often full of cheery conversation with coworkers. The weather in mid-April is usually beautiful, and—at 10 miles into the race—Natick Common is early enough that the lead runners are still together, and most runners are looking strong and fresh. I try to arrive early so that, before the elite women and men run through, I can watch most of the push-rim wheelchair, handchair, and mobility impaired athletes. Each year, my appreciation for what they’re doing deepens a little bit more, even as I simultaneously become more certain that, for a true athlete, it’s far more unnatural not to do the thing you love no matter how great the challenge. This year, like previous ones, I left the marathon feeling inspired and eager to do something. In 2010, even though I had been running for about a year, I knew I needed to start racing again. In the three years that followed, I’ve had events events to look forward to, and the marathon gets my competitive juices flowing. Over the last few years there’s been a growing feeling inside of me that I want to run this race—my race, the one I’ve been watching for fifteen years, the one that everyone loves whether they run or not. Sometime last year while running the course, I started to say “yes” to the thought of a marathon as long as I someday qualified for and ran Boston. Today, as I walked back to the office, I was really eager to put my lingering cold behind me and get outdoors, to have a good run, and to get back to training. Like last year and most of the rest, I counted the number of buses on the Mass Pike between the I-495 and Natick exits on my way to work. There were 95, including the police-escorted VIP bus. I like seeing those flashing lights, because I love the idea that (for at least one day) elite athletes are treated like the extraordinarily talented, hard-working people that they are. Like last year, I had some great conversations while waiting for the elite runners to arrive. This year, instead of being with complete strangers, I hung out with some of my coworkers. Five people from my group showed up, including Mr. 2:22 himself, who decided it would be nice to be with us this year instead of right downtown in the midst of the action. I learned that one of my coworkers got a Southern Baptist education from pre-K to 12th grade because there were a lot of bomb threats in her part of Florida at the public schools, and her parents (both Buddhists) felt better about the odds of giving her a culture shock instead of an actual jolt. Like most years I watched the finish of the race online at my desk since the office cafeteria crowd was deep into the Red Sox baseball game, and I’ve fought the battle before to switch from the Sox game to the marathon and just barely made it out alive. But this year, as we all know, was a little different. Around 1:00 a coworker from another group called to ask if one of my peeps was running Boston this year. He had taken the day off to go down to the finish and hadn’t seen him come through yet. No, I said, he watched the race with us from Natick. Later in the afternoon, a couple of coworkers stopped by, interrupting a code review, and nervously asked if I had heard about the “explosion at the marathon finish.” Surely it was just an electrical explosion in a manhole or something like that, I thought, and went back to my work. After finishing the code review, I checked a slow-loading news site, and couldn’t believe what I was seeing. When Lisa called a bit later and asked if all my coworkers were okay, I got choked up for the first time, thinking about what might have happened to them and to the other people I know who watched the marathon at different places on the route or were running it (including Pat, my swim peep). On the commute home I watched all of the unmarked cars and special detail units with their flashing blue lights speed down the turnpike toward Boston in a bizarro inversion of my drive into the office nine hours earlier. I really needed to go for a bike ride or a run when I got home. Even if it couldn’t help me make sense of what happened, it would at least clear my head or wear me out enough to not think about it for a while. But I knew that getting “worn out” was exactly what I didn’t need to do while recovering from this cold, which seems to be about 80% better, so I took it easy and got to work downloading and editing my photos from the race. As I was looking at the photographs I realized something quite vividly. Regardless of who did this and why, it won’t change a thing about how deeply marathon fans love this race. Even though most of us will probably never run it, it’s our race. It’s my race. Seeing the vans full of SWAT police in the past hasn’t ever made think twice about why they’re part of the event preparations and decide that I want to stay indoors on a glorious spring day (or even a miserably cold and drizzly one for that matter) to watch the race. And today, when I saw the SUV full of bomb squad officers drive by ahead of the elite runners, it didn’t change an iota about how much I loved the race or whether I want to be part of it some day. Just as I’m sure that, despite the actual bombings, there will be just as many people working their hardest to attain a coveted Boston qualifying time or raising as much money as they can to justify their charity entry. This race—the oldest marathon in North America—has been run 117 times and will be run again. We love this race because of its history and because it tells us something about ourselves. New Englanders are flinty, contrarian, history-bound, and stubborn. This is probably the surest way to make sure that the marathon will be held long after humanity has given up on the idea of competitive road running. I mean, just think about it: The marathon happens on the Monday closest to the anniversary of the Battle of Lexington and Concord, an event steeped in the notion that a free people choose not to live under threat of coercion or fear and the belief that our nation is what we actively make it. Someday, hopefully soon, we’ll know more about what happened today and why. As a result, we will grow and adapt. But our love for this race and this day will never be diminished. This entry was posted in General, Photography, Running, This is who we are. Bookmark the permalink. Beautifully done thanks for not jumping on the band wagon! You have honored the race as many have not! Beautiful post Jeff. I was worried about you when I first heard the news. Thanks for sharing why the marathon is so important to you and held close in so many hearts. Much love. As said above, this is a beautiful post. Yesterday’s events shook up the world and in particular the running community. My goal as a runner is to one day qualify for Boston and I am more determined than ever. Brilliant and beautiful, my friend. I am runner 212o2. Just wanted you to know I will be back next year to run for all of you from Hopkinton to Boston, for those who died or were injured on 4/15, and for those families dealing with the pain. But also for everyone along the course, I want you to cheer for yourselves, for your neighbors and loved ones. You are the most amazing people to ever line a course. Nothing can stop you. As our MI friend Jason Pisano said: Impossible Is Nothing.